Growing a stand of blackberry bushes (_. Water blackberries every seven to 10 days during spring and summer, concentrating the water at the base of each plant rather than using an overhead sprinkler system. 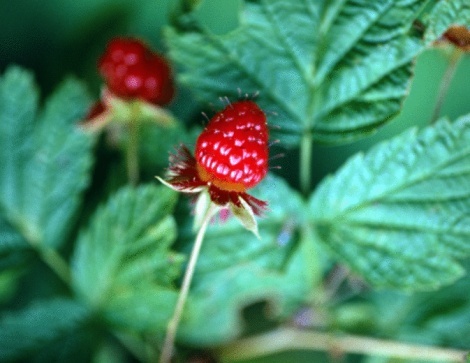 In mid- to late summer when you start harvesting the berries, water the plants every three to four days. Apply 1 inch of water each time, which is enough to moisten soil 6 to 12 inches deep. Fertilize blackberry bushes in late spring or early summer. Doing so gives the plants a boost right as their fruit development goes into full swing. Use a 10-10-10 fertilizer just before one regular watering. Use 1/4 pound of fertilizer per blackberry bush. Spread the fertilizer in a circle 12 inches from the base of each bush. Spread mulch evenly over the soil under the bushes once each year, in spring. Pine needles, rotted leaves, bark and wood chips are the best mulches to use for blackberries. Maintain an even, 3- to 4-inch thick mulch layer on the soil surface, leaving 3 to 4 inches of space without mulch around the base of each bush. Mulch breaks down slowly over time. Each year when replenishing the mulch, bring its total level up to 3 to 4 inches. If you add too much every year, eventually the mulch layer will be too deep, possibly smothering the bushes. After harvesting blackberries' fruits in late summer, identify all the canes, or stems, that produced fruits, and cut them to the soil line. In early spring, just before new growth appears, prune out extra canes until you're left with five to seven sturdy canes per bush. Trim back side branches -- the lateral branches growing from the main stalks -- to 12 inches long. Remove canes that rub against each other, and cut out broken or otherwise damaged canes. Pinch new canes back 4 inches once to make them 30 to 36 inches tall. Blackberry bushes attract several pests, but you can keep the pests from getting out of hand if you identify them correctly and treat their infestation early. Check the leaves, especially their undersides, for aphids and spider mites. Also keep an eye out for caterpillars feeding on the leaves and for beetles. Aphids are tiny green, white, tan or black insects that typically feed in groups. Spider mites are minuscule white insects. You'll probably see a fine webbing on leaves when spider mites are present. Caterpillars are wormlike, and beetles come in numerous forms but always have six legs. Inspect the flowers for thrips, which are tiny, longish insects that are white, tan or black and feed on plant sap. Treat insects on blackberries with a pesticide that contains malathion, spraying it only when beneficial insects, such as honeybees, ladybugs and other pollinators, are not present. Put on protective clothing before mixing or touching a pesticide. Wear rubber boots, rubber gloves, a long-sleeved shirt, long pants, socks, goggles, a respirator, a waterproof hat and rubber gloves. Mix 1 fluid ounce of malathion pesticide with 1 gallon of water in a handheld sprayer. Spray the pesticide solution directly in the pest-infested areas of each blackberry bush until the leaves are wet but not dripping. Reapply the pesticide solution up to three times, with applications at least seven days apart, until the pests are gone. Occasionally, blackberry fruits develop white bumps. They are discolored drupelets. Each blackberry fruit is made up of multiple drupelets that are typically deep bluish black. The white bumps are most likely caused by heat or sun scald. Although treating the problem isn't possible, you can still harvest the blackberry fruits and eat them. Yellowing that starts near the bottom of the canes and gradually spreads up a blackberry bush is likely a symptom of the disease Verticillium wilt. It is caused by a fungus lives in soil. Once it affects blackberry canes, no viable treatment other than removal of the infected plant exists. Blackberry bushes are susceptible to orange rust, a fungus that appears in spring as bright-orange spots, typically on the underside of the affected leaves. 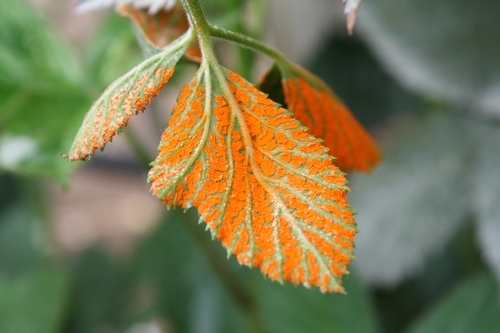 Remove and destroy individual leaves as soon as you see orange rust on them. If the disease spreads in an infected plant, then the plant can't be cured. The disease can spread to healthy plants. The best way to get rid of the problem is by digging up whole plants that are infected and discarding them in the trash.